Soochow University robotics professor Li Xiangpeng didn’t mince words in a new interview about his latest robot. T-1000? The killer assassin android on a special mission to murder the teenaged John Connor? That T-1000? Thankfully, it wasn’t T-1000’s killer instincts that prompted Xiangpeng. Instead it was the liquid-metal robot’s shape-shifting ability that fascinated his research team. And while the robot they built is far less advanced than the one depicted in James Cameron’s sci-fi classic, it could pave the way for bots to come. Xiangpeng and other researchers from China and Australia detail their creation in a paper published earlier this month in the journal Advanced Materials. Ultimately, their robot comprises just three parts: a plastic wheel, drops of a gallium-based liquid metal alloy, and a small lithium battery. Voltage from the battery alters the liquid metal’s center of gravity, which causes the palm-sized robot to roll in one direction or the other. The bot may be a far cry from T-1000, but the researchers believe their creation could serve as inspiration for other devices, the same way James Cameron’s 1991 smash-hit followup to “The Terminator” inspired them to build this tiny bot. 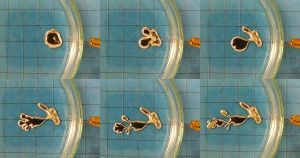 “In the future, we expect to further develop soft robots incorporating liquid metal that could be used in special missions such as searching for and rescuing earthquake victims, since they can change shape to slide under doors or make it through spaces humans can’t get into,” researcher Tang Shiyang told SCMP. Saving people following natural disasters — now that’s the kind of mission we can get behind.